Excellent! That’s really what I needed. 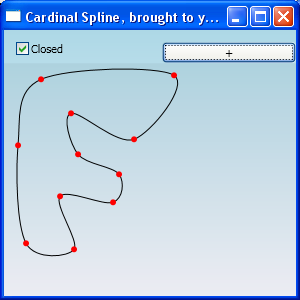 I’m not familiar with spline. It would be better if you can explain the algrithom you used. This is some excellent work! After figuring out that it was a cardinal spline I was trying to create, then finding out if I was using GDI+ I could do it with one function, your code has allowed me to use WPF with the same ease! You’ve massively helped me out! Well done!